This weekend saw us putting in some miles for some predators, perch and zander were the targets but there is always chance of a pike. Saturday. River Mole. Target: Perch. Hard work even catching bait and we didn't even see a perch - are they even in this river? Just a jack on a 3D Bleak to save the blank! Sunday. Cov Canal. Target: Zander. The cold weather scuppered our plans, according to a local they stopped feeding about 3 weeks ago! Just a micro-pike (above) on a jig to save a blank. But a big thank you to Dan of The Lure of Angling for being our guide - if they aren't feeding, we can't catch 'em. But plans were hatched for a return visit - which I'm very much looking forward to. The cold is when the big'uns turn up the problem is they are lazy too, so sadly unless you drop a bait on the head of one you'll struggle. Needle and haystack and all that. I think we’d all be happy with a handful of 1 or 3 pounders each, zeds are pretty rare so getting a few on the scorecard would be great. Big ‘uns are a future target. We’re hoping to get back in some warmer weather to bag a few (or do we say that every year?). 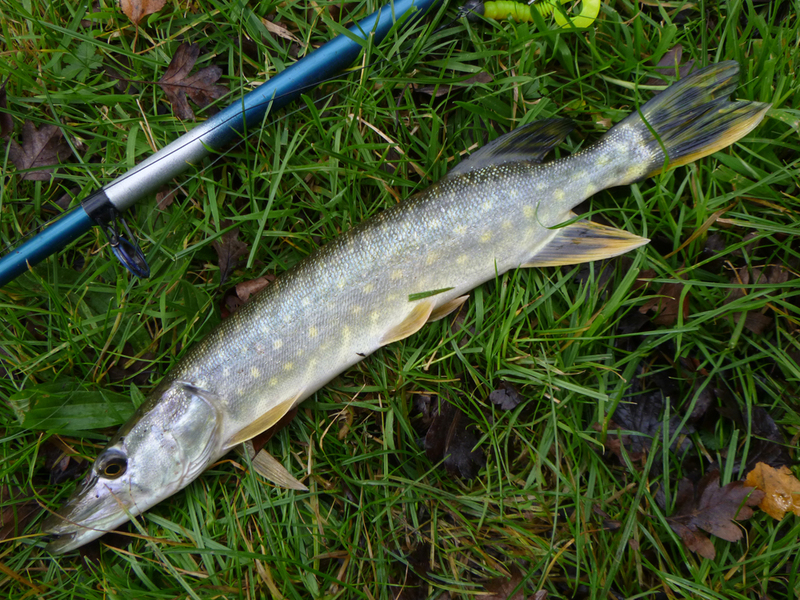 is that the lure or the pike?hope you get the same satisfaction seeing a mini-pike straight out of the mint as i do seeing a mini barbel! I love them, both mini-pike and mini-barbs, future twenties and doubles!